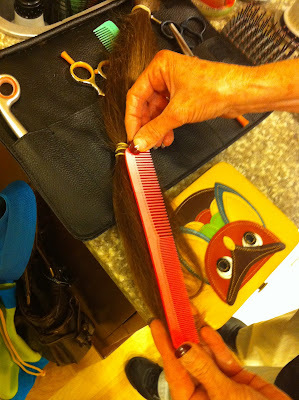 On Wednesday, I cut off 12.5 inches of my long, hippy dippy hair and donated it to locks of love. The still wet 2 hours later ponytail. The 45 minute blow dryer/straightening time. The breaking. The splitting. Sigh. Sigh. I hate it. MAKE IT COME BACK! Nah, I'm teasing. I don't LOVE it, but it's fine. (I do love washing it and not finding twenty foot hairs on my pillow in the AM.) Plus, with the way my hair grows, I'm sure it will be back in no time. I think it's cute and very fitting for the summer. I liked it long too though. I love the new hair do Kat! Very stylish!! !